Android Emulator is included with Android Studio. Versions of the emulator prior to 25.3.0 were distributed as part of the Android SDK Tools. To ensure you have the latest version, check the SDK Manager for updates. For Android Emulator versions prior to 25.3.0, see the Android SDK Tools release notes. For details of bugs fixed in each release, see the Android Studio release updates blog. Fixed twitching and incorrect frame display on Intel GPUs when running Android Q system images. Fixed issues where black screen would display when using Android Q system images with Pixel 2 XL skins. The latest BIOS binaries are now used to start up the emulator. This change can help reduce "vCPU shutdown request" errors that happen sometimes when launching the emulator on Windows. Backported a fix for the "wrong display when resuming Android Q system images from a snapshot" issue. Backported the headless emulator build. For more information, see the Emulator 28.1.8 Canary release notes. Delete both the ~/.android/adbkey and ~/.android/adbkey.pub files. A recent post on Reddit detailed how the guest Android OS would always be using the host microphone's audio, and thereby allowing "Ok Google" to work unexpectedly. We're sorry about this and will work with the Android team to make sure hotword detection is disabled in the system image as well. Actual host audio data is now squelched by default. When the guest uses the microphone, silence is passed over instead of the host's audio. If you want to use the host audio data, you can now enable that option by going to Extended Controls > Microphone and enabling Virtual microphone uses host audio input. This option is automatically disabled whenever the emulator is restarted. We found that at random intervals, all apps installed get updated, even when the user is not logged in. During the process, CPU usage is driven to the number of cores x 100% (typically ~400%) in GMSCore and dex2oat. You can mitigate this issue by disabling auto app updates in the Play Store app. When on the home screen and without any app foregrounded, there can be a great deal of CPU usage (~25% with spikes to 50%). This is caused by hotword detection that constantly pings the host. You cannot mitigate this issue by disabling host audio input because the CPU cost is primarily caused by the time that it takes to travel to the guest from the host. However, you can mitigate this issue by revoking microphone permissions from the Google app. The third source of high CPU usage is animations. We have found that by optimizing the graphics driver stack we can also reduce CPU usage even when the emulator is not idle. We will be rolling out graphics driver optimizations incrementally as part of Project Marble. When using a mapped file as the RAM snapshot, the emulator now unmaps the file mapping explicitly on exit. Fixed an issue on Windows that caused the emulator to freeze on snapshot load with certain models of Intel GPUs. Fixed an issue that caused an unauthorized ADB device state when using a non-standard ANDROID_SDK_HOME location. Fixed an issue on Windows that caused the emulator to crash when booting system images with CPU acceleration disabled. Fixed the pixelated emulator display issue. Downsampling should now be working. Fixed an issue on macOS 10.14+ where the virtual scene camera mouselook control could become too sensitive due to an interaction with new accessibility security settings. Fixed an error in timezone calculation that could cause the emulator clock to sporadically change. Fixed rendering errors in various cocos2d and Unreal engine apps. Added support for more webcams on Windows by taking any incompatible frame sizes and dynamically resizing them to fit the camera setting in the Android guest. This update includes several new features, improvements to existing features, and bug fixes. The emulator now uses less RAM overall, especially when using system images with API level 28 or higher. These system images include improved memory usage for guest-side graphics drivers. Reduced emulator memory usage during long-running tests. If you still experience issues with memory usage during long-running tests, please create an issue that describes your use case in Issue Tracker. Fixed an issue where the QEMU AIO context could leak on Windows. Note: Some Windows emulator users could not launch emulators due to exceeding the RAM commit charge. For help with this issue, see the emulator Troubleshooting page. You can now launch multiple instances of the same AVD and run them concurrently. Instances that you launch after the first instance are read-only, and their changes to the guest virtual disk are discarded on exit. To run multiple instances of the same AVD at the same time, launch any instances after the first instance from the command line using the -read-only flag. This feature is made possible by copying the QCOW2 files associated with the writable parts of the Android image. To help you manage disk space, we have also bundled the qemu-img command line tool to allow you to pre-commit QCOW2 files before launching multiple instances. In addition, when used in tandem with the File-backed guest RAM snapshots feature, multiple AVD instances share the primary AVD Quickboot snapshot as a common source of copy-on-write guest RAM. This property means that the instances share much of their RAM in common. Use this feature to run tests that require multiple devices to run in parallel. We appreciate your feedback on possible use cases that are part of your normal interactive or CI workflow. Please create or upvote issues in Issue Tracker. By pre-allocating and mapping guest RAM as a file, the emulator can now save Quickboot snapshots during runtime, instead of doing all of the work on exit. If you currently experience long save times when closing your emulators, enable this feature to improve your Quickboot performance. By default, a Quickboot snapshot is saved on exit and loaded again every time, like suspending and waking a real device. Use the -no-snapshot-save or -read-only flags when launching the emulator from the command line. Go to Extended Controls > Snapshots > Settings and switch Auto-save current state to Quickboot? to No. After you run this command, the emulator Quickboot snapshot will stay at that checkpoint. Run the same command again to load the emulator from your checkpoint. Note: When you run multiple concurrent instances of the same AVD, the emulator disables auto-saving, but those instances then use any existing Quickboot RAM file as a common source of copy-on-write memory. Snapshots that are taken and loaded through the Snapshots UI function as they did before, with no file mapping. When you start the emulator from a snapshot (either using the -snapshot command line option, or launching from a snapshot in the AVD manager) the emulator disables both auto-saving for Quickboot snapshots and saving Quickboot snapshots on exit. This reduces the chances that the Quickboot snapshot will be unintentionally overwritten, and avoids slow fallback paths that do not use file-backed Quickboot snapshots. x86: gdbstub now provides access to SSE registers. QCOW2 shrinking now supported in qemu and qemu-img. Fixed issues with screen readers and added better support for these tools in the Screen Record and Snapshot UI. Made the Quick Boot notification icons more accessible to colorblind users. Fixed an out-of-bounds memory access issue that could occur for OpenGL ES vertex array pointers. Some older GPUs did not support OpenGL 2.1 or greater (which is required), or had other reliability issues. These issues could cause the emulator to crash on start, freeze, or be unusable on the default GPU setting. The emulator now automatically switches to the Swiftshader renderer if it detects that these GPUs are in use. Fixed issue where the virtual Android display would only show up in the top left corner. We believe this was due to misconfigured Qt environment variables. The emulator now overrides all Qt scaling-related environment variables. Fixed an issue where the emulator crashed in some situations when loading GLES1 apps from a snapshot. Fixed concurrency issues in OpenGL and launching render threads that could result in double frees or corrupted data. Android Emulator now supports ASTC LDR compressed texture support (GL_KHR_texture_compression_astc_ldr) for system images that use API level 28 or higher. Most modern GPUs should now be able to launch the emulator with OpenGL ES 3.x enabled by default without using the GLESDynamicVersion feature flag. -gpu guest (software rendering in the guest) has been deprecated. System images for API level 28 or higher now automatically switch to using Swiftshader instead (-gpu swiftshader_indirect). If the emulator is launched from the command line using the -no-window flag, the default renderer is now Swiftshader. The emulator can now update bearing along with latitude and longitude position. The magnetometer virtual sensor adjusts itself dynamically to magnetic north by inferring motion when playing back a GPX or KML file. The altitude is no longer restricted to being between -1,000 and +10,000 meters. Fixed an issue where the virtual GPS location would not be updated periodically unless the Extended Controls window was opened at least once. On Windows, more webcams are now supported because the emulator dynamically resizes the camera frames that are delivered from the webcam. This feature also prevents errors in frame delivery from causing the emulator to hang. To address issues with running out of disk space on Play Store images, the emulator now automatically resizes the userdata partition to 6 GB when running with a fresh Play Store AVD. If the emulator is unable to start due to insufficient free RAM, an error message is now displayed. If you are on Windows and notice that there is RAM free, but you are still unable to start the emulator, the commit charge may have been exceeded. For help with this issue, see the emulator Troubleshooting page. Fixed various issues with memory leaks, memory corruption, and CPU usage. If you are experiencing crashes, memory leaks, or other high resource usage, please create an issue in Issue Tracker. Fixed an issue on Windows where the emulator clock would not be in the correct timezone. Fixed emulator slowness and hangs on Linux systems with spinning harddrives (HDDs). Fixed some compile warnings that could lead to stack corruption on macOS. Fixed an issue with destroying thread pools that could cause a crash if one of the threads was not successfully created. Fixed an issue on macOS where timers would become unreliable, leading to hangs and other strange behavior. If you experience emulator hangs on macOS, please create an issue in Issue Tracker. Fixed issues involving sporadic crashes, including an abort due to opening too many instances of /dev/urandom. Fixed an issue that caused the emulator to fail to start after the first time if ADB was terminated forcefully. The MIPS build has been removed. If you still require MIPS, please create an issue in Issue Tracker. Fixed an issue where the emulator window would have an afterimage or teleport offscreen when resuming a snapshot where the device orientation was different from the AVD's default orientation. Fixed issues involving crashes when saving snapshots. This creates new snapshots in a folder where copy-on-write is disabled. We would like to mention HAXM 7.3.2 again because it must be installed in order for recent system images to run properly on the emulator. HAXM 7.3.2 should already be available in the Stable channel, and can also be installed manually from https://github.com/intel/haxm/releases. Fixed random crashes of guest OSes that use a recent Linux kernel (>= 4.6). For example, Ubuntu 18.04 (#39, #74). Due to low usage and high maintenance costs, we are planning to deprecate the 32-bit version of the Android Emulator that runs on Windows. We will roll out a transition plan before removal and end-of-life for the 32-bit version of the Android Emulator. However, we are actively seeking any feedback or concerns with this future change. Please let us know in Issue Tracker if you currently rely on the 32-bit version of the Android Emulator that runs on Windows and tell us how we can best work with you going forward. Some users reported that the emulator has been running slow. We identified one possible cause where the AVD RAM size in the AVD's config.ini file was being set incorrectly. Some users were having difficulty diagnosing why the Windows Hypervisor Platform (WHPX) failed to initialize when they activated a WHPX emulator. To help you diagnose these issues, we have added more informative error messages. You can enable these error messages by running the emulator from the command line using the -verbose flag. Note: For users with Hyper-V based setups, you must enable the Windows Hypervisor Platform feature before you can activate a WHPX emulator. For more information, see Configuring VM acceleration with Windows HypervisorPlatform. Fixed OpenGL errors that occur when loading a snapshot in the camera app. You can now save multiple AVD snapshots for a given device configuration and choose which of the saved snapshots to load when you start the emulator. Starting with Android Studio 3.2 Canary 13, each device configuration includes a control in the advanced settings in the Virtual Device Configuration dialog with which you can you can specify which AVD snapshot to load when starting the AVD. To accommodate this expansion of the snapshot features, we have added a Snapshots category to the Extended controls dialog. This new pane contains controls for saving and loading AVD snapshots, including the controls for saving and loading the quick-boot snapshot that had previously been in the Settings pane. You can edit the name and description of each saved snapshot. HAXM 7.2.0 is now available in all channels. This update includes bug fixes and improved support for large amounts of RAM. Also, with this HAXM update and Emulator 27.3 and later, snapshots load their contents into RAM on demand rather than loading the entire snapshot when the virtual device starts. This change should greatly decrease the time needed to load a snapshot. For details, see Configuring VM acceleration. You can now record video and audio from the Android Emulator and save the recording to a WebM or animated GIF file. The screen recording controls are in the Screen record tab of the Extended Controls window. Tip: You can also open the screen recording controls by pressing Control + Shift + R (Command + Shift + R on Mac). To begin screen recording, click the Start recording button in the Screen record tab. To stop recording, click Stop recording. Controls for playing and saving the recorded video are at the bottom of the Screen record tab. To save the video, choose WebM or GIF from the menu at the bottom of the tab and click Save. Screenshots are saved in PNG format. Developing and testing augmented reality apps (AR) with ARCore is now even easier with the new virtual scene camera, which allows you to experiment with your AR experience within a virtual environment. For information on using the virtual scene camera in the emulator, see Run AR apps in Android Emulator. The Google Play Store is now enabled for Pixel and Pixel 2 device images. This is indicated in the AVD Manager in Android Studio 3.2 and later with the Google Play logo in the Play Store column. AVDs with Google Play Store enabled have a Google Play tab in the Extended controls dialog that provides a convenient button for updating Google Play services on the device. You can now load a Quick Boot snapshot without restarting the emulator. To load a snapshot, open the Extended Controls window to the Settings page and click the Load Now button. We have made many improvements to the loading and saving of snapshots to improve efficiency of resource usage and to minimize the time that each operation takes. If you still experience unusually long saves, please file an issue, providing details of your CPU, RAM, and settings of any antivirus / firewall / security software that is running. When using images for API 27 or later, the emulator can render the Android UI with Skia, which can render more smoothly and efficiently. For now, use of Skia requires that you explicitly enable it. On Windows, Android Emulator now uses Media Foundation as the webcam back end, which greatly improves performance and frame rate for webcam capture, up to 720p 30 FPS. On Mac, you can now use webcam0 and webcam1 together. The -phone-number-prefix command-line option has been changed to -phone-number [number], which allows setting of the full phone number. You can now use alphanumeric SMS addresses. The Linux version of the Android Emulator is now built using a modern Clang C++ toolchain. This change fixes the issue of the emulator failing to start due to libGL and libstdc++ errors. Fixed several causes of crashes and hangs. To avoid crashes and hangs caused by not having enough free disk space, the emulator now checks for sufficient free disk space on startup, and will not start unless at least 2 GB is free. Fixed an issue that prevented some Unity games from rendering. Fixed DNS issue that caused the emulator to be unable to connect to the network. Fixed an issue that caused changes to the internal storage allocated to an AVD through the Virtual Device Configuration dialog to not work. Fixed an issue of many adb processes being created and not properly shut down. Fixed an issue that caused the rotate buttons and other parts of the UI to become unresponsive unless the Extended controls window was open. Fixed an issue that caused copy and paste from the host to not work unless the Extended controls dialog was opened at least once. Fixed an issue that caused SMS and cellular functionality to be disabled after loading a snapshot. Fixed an issue that prevented re-positioning the AVD on some Mac screens. Fixed issues with flickering and blank screens on newer MacBook Pro computers when running AVDs with Pixel 2 XL skins. Fixed issues with blank screens when switching into zoomed mode while a frameless emulator was active. Fixed an issue that caused the device skin and emulator contents to scroll out of sync when zoomed in. If you are still experiencing hangs or other instabilities, please file an issue. With this update, a current system image, and a preview version of Android Studio, you can use Android Emulator to run augmented reality applications built with ARCore. For detailed requirements and instructions, see Run AR apps in Android Emulator. 720p frames can now be captured from an attached webcam. To work with Android 8.1 (API level 27) and higher system images, any attached webcam must have the capability to capture 720p frames. Fixed an issue that caused webcam capture to sometimes output a distorted or all-green image. Fixed an issue that made it possible to see the following message even when there was no actual hang: "emulator: ERROR: detected a hanging thread 'Qt event loop'. No response for 15000 ms". By default, emulators with device skin files are now shown without a surrounding window frame. To show the surrounding window frame, enable Show window frame around device in the Settings pane of the Extended Controls window. You can save an AVD snapshot at any time using the Save Now button in the Settings pane of the Extended Controls dialog box. The emulator reduces the time that it takes to save a snapshot in many cases by saving only the difference between the current state and the previously saved snapshot. For details, see the Quick Boot documentation. The emulator has been updated to use QEMU 2.9. Optimized I/O and finer-grained I/O thread locking for greater performance. Fixed bugs since QEMU 2.8 (26.1.4). New implementation of the HAXM back end. See the full list of changes in the QEMU 2.9 change log. The emulator's Swiftshader renderer now conforms fully with OpenGL ES 3.0. For details of the Swiftshader renderer, see the Settings > Advanced section of Extended Controls. Fixed an issue where clipboard sharing was not working unless the Enable clipboard sharing option was toggled off and on. Fixed a hang when using the Swiftshader rendering back end with low-resolution AVDs. ANGLE for rendering on Windows is now disabled by default. If ANGLE works better for you, you can re-enable it with command line flag -gpu angle_indirect. Or, open the Extended controls window, navigate to Settings > Advanced, and select ANGLE D3D11 for the OpenGL ES renderer setting. Fixed an issue where Shift+B does not type a capital B character. New Quick Boot feature provides faster emulator start times, based on a snapshot of your AVD instance. Quick Boot is enabled by default for all AVDs. Although the first time you start an AVD it must perform a cold boot (just like powering on a device), all subsequent starts are fast and the system is restored to the state at which you closed the emulator (similar to waking a device). Yes: Always save quick boot snapshot when you close the emulator. This is the default. No: Never save quick boot snapshot; always perform a cold boot. Ask: Prompt whether or not to save quick boot snapshot when you close the emulator. Your selection applies only to the currently open AVD. For more information, see the Quick Boot documentation. Added support for Mac OpenGL ES 3 (for system images using API level 24 and higher, Google APIs, and the x86 ABI). For added stability in OpenGL ES 2+ apps, emulator now uses OpenGL core profile if available. -gpu swiftshader_indirect: Faster, more stable variant of Swiftshader that works with Quick Boot. -gpu angle_indirect (Windows only): More stable variant of ANGLE D3D that also works with Quick Boot. The older -gpu swiftshader and -gpu angle options are now deprecated. In the Extended controls window, the "SwiftShader" and "ANGLE" options for the OpenGL ES renderer setting in Settings > Advanced now use the *_indirect variants. This is a minor release with bug fixes, performance improvements, and small feature changes. This version is now required to use the latest Android 8.0 system images. They are Treble-compliant, featuring separate vendor.img partitions. Improved memory usage. The peak working set of memory pinned by HAXM is no longer equal to the size of the AVD's RAM; instead, memory is paged in on demand. This should help the emulator run more reliably on machines with lower amounts of RAM. The emulator with HAXM 6.2.0 can now boot faster on macOS, skipping a lengthy initialization phase. Fixed issues with black screen on boot when performing guest-side software rendering by falling back to host-side software rendering with Swiftshader. Latest revisions of system images for API levels 19 - 25 with Google APIs should have working guest-side rendering. Older Intel iGPUs have driver issues on both OpenGL and ANGLE D3D drivers. Users with Intel HD Graphics 3xxx and older will use Swiftshader. Some users reported the inability to use API level 25 images because of a bug in which "Pixel Launcher keeps stopping." This seems to be a driver issue in some Intel HD 4xxx models. So they will be switched to use ANGLE automatically. For best results with GPU emulation, we recommend either to use a discrete NVIDIA or AMD GPU, or a newer Intel GPU (Iris, HD 5xxx, HD 5xx/6xx). Fixed an issue where the emulator would fail to start (OpenGL emulation failed to initialize) if the AVD was configured with hw.gpu.mode=host and the emulator was launched in a remote desktop client. Clarified "OpenGL ES API level (requires restart)" settings; added an option to downgrade from OpenGL ES 3 to OpenGL ES 2 if experiencing issues or needing to test on lower OpenGL ES API levels. Mesa renderer is deprecated; hw.gpu.mode=mesa will now be automatically switched to use Swiftshader on the host. The emulator is now fully compatible with macOS 10.13 High Sierra through either Hypervisor.Framework or HAXM 6.2.0. Hypervisor.framework is now enabled by default on macOS for 32-bit x86 images to improve performance and macOS compatibility. If you experience issues with it specifically, please file a bug report and append HVF = off to ~/.android/advancedFeatures.ini (create this file if it doesn't exist). Fixed issues with no internet / failure to attach debugger while using Hypervisor.framework. To enhance compatibility and performance of webcam capture, the QTKit-based camera capture has been replaced with a buffered one based on AVFoundation. Added support for Wi-Fi in some system images (currently only API level 25). An access point called "AndroidWifi" is available and Android automatically connects to it. Wi-Fi support can be disabled by running the emulator with the command line parameter -feature -Wifi. Some users raised the concern that the fixed-size Play Store system images did not have sufficient storage. As such, we've increased the size to 2 GB by default (up from 800 MB). Added a keyboard shortcut (Ctrl+Shift+U) to open the bug reporting UI page directly from the settings page. Fixed an issue where if an older CPU with Intel x86 EPT but without UG was used, the emulator would fail to boot if more than one core was configured. Fixed an issue where HyperV would be improperly detected if the emulator was itself running in a Xen hypervisor. Fixed an issue where the emulator would crash on start in some Linux configurations. This release includes new features and performance improvements. Added the ability to define a custom HTTP proxy configuration in the extended controls (click More , and then click Settings and Proxy). 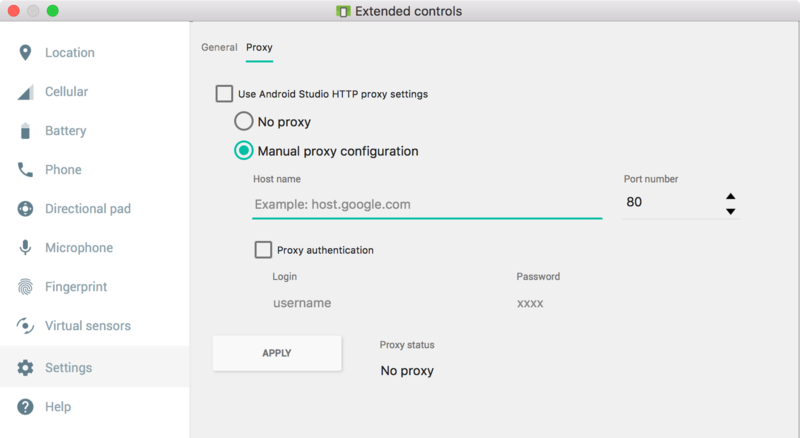 By default, the emulator uses the Android Studio HTTP proxy settings, but this screen allows you to define a manual proxy configuration. Open a VNC viewer, such as tightvnc viewer, to connect to port 5901. And then enter change vnc password into the console, and enter a password. Android O is not currently supported for VNC mode. Added a File a bug button in the extended controls Help screen (Click More , and then click Help and Emulator help). Clicking File a bug opens a dialog where you can see the bug report details such as the screenshot, the AVD configuration info, and a bug report log. You can then save the report for yourself or report emulator issues. Added gyroscope sensor to emulator and virtual sensors panel. This requires a system image with gyroscope support to work (currently API level 24 and 25). Added host-preferred DNS to Qemu DNS list on Windows, when multiple virtual network interfaces on the host introduce multiple DNS addresses which are not functional for the emulator. Added experimental macOS Hypervisor.Framework support for 32-bit x86 images on macOS 10.10+ through server flags, which should improve boot time and performance. If you experience problems with it, add the line HVF = off in ~/.android/advancedFeatures.ini. OpenGL ES 3.x is now enabled by default for system images and host GPUs that support OpenGL ES 3. Currently, only Android O (API level 26) and Windows/Linux hosts support OpenGL ES 3. If you experience problems with OpenGL ES 3, add the line GLESDynamicVersion = off in ~/.android/advancedFeatures.ini. Emulator now uses offscreen OpenGL FBOs for all rendering except final display image posting, which should help with color consistency issues across platforms. After collecting data on sudden emulator slowdown issues, we have determined that the problem may have to do with some interaction between older Intel OpenGL drivers and Windows updates. As such, users with Intel HD 4000, 3000, 2000 (and related GPUs) now have rendering set by default to either a D3D renderer (ANGLE) or Swiftshader (software renderer). This release is compatible with API level 26. It also includes a number of performance improvements and bug fixes. Adds online-updateable feature flags for quickly addressing issues stemming from problematic hardware configurations. This allows Google to roll out fixes and features that are dependent on user configurations by updating server-side flags. If you notice issues with specific hardware, please report a bug so we can investigate the problem. New support for rotary input for Android Wear API level 25 system images. To emulate the rotary input dial on a Wear device, click the Rotary Input tab on the extended window. The Crash Reporting dialog is now resizable and no longer resets When to send crash reports to Ask without input. The 32-bit emulator now requires that the maximum AVD RAM size be less than or equal to 512 MB, in order prevent the emulator from running out of room in the 2 GB virtual address space. Adds support for absolute paths in emulator images. Adds a new tab in the extended window for Google Play Store images that displays the Play Services version and a button to check for updates to Play Services. Adds a dropdown to select the OpenGL renderer on the Emulator Settings page. If you are experiencing issues with the OpenGL driver on a Windows machine, try using the ANGLE (D3D11) or ANGLE (D3D9) options (requires a restart). If you are experiencing issues with the OpenGL driver on a non-Windows machine, try using the Swiftshader software renderer (requires a restart). Fixes a rare crash on exit when the emulator receives both exit and minimize commands. Fixes an issue where the emulator takes 300% of the CPU and holds it after resuming the host computer from sleep or when the emulator has been running for a long time. Fixes a crash when the emulator is shutting down. Note: HAXM v6.1.1 is available for Mac users through the SDK Manager as of March 30th, and will be available for Windows users soon. Revises the installation error message displayed when the installer fails to detect Intel VT-x on Windows, usually because Hyper-V is enabled. Adds support for accelerating the Android Emulator in a Hyper-V-based Windows VM. This update requires that the host Hyper-V instance (the one that manages the Windows VM/guest) use the latest version of Hyper-V with nested virtualization enabled. Hyper-V must be disabled in the guest Hyper-V instance (the Windows VM). Android SDK Platform-Tools revision 25.0.4 or later. Android SDK Tools revision 26.0.0 or later. Compatible with API level 26. Fully GLES 2.0 compliant. Given a host GPU that has conformant desktop OpenGL drivers, the emulator now passes 100% of the Android CTS dEQP-GLES2 mustpass list. This has been released for API level 24 x86 images (revision 11 and higher) and will soon be included for all system images. Improved video playback performance. The emulator now stores all video color buffers in host/guest shared memory and performs necessary final YUV to RGB conversion in the GPU. 1080p30 should be well within reach of most systems now. This has been released for API level 24 x86 images (revision 11 and higher) and will soon be included for all system images. The emulator now correctly unregisters itself from the adb devices list on exit and closes open TCP ports on Linux machines. adb connections are now more reliable. A running emulator is detected faster and doesn’t go into “offline” or “unauthorized” status anymore. As of this release, the Android Emulator will be released separately from the SDK Tools. This release contains a variety of performance improvements, new features, and bug fixes. Fixed a crash occurring on some GPU configurations by disabling GLAsyncSwap by default. This feature was added in 25.3.0 to improve frame timing and frames per second for games and video, but causes the emulator to fail on some unknown machine configurations. You can manually enable it by opening the android_sdk/emulator/lib/advancedFeatures.ini file and setting GLAsyncSwap = on. Android SDK Tools revision 25.3.0. Updated emulation engine to QEMU 2.7, including all recent bug fixes, improved performance, and new features. The emulator now uses SwiftShader as a pure software renderer on the host. Increased overall responsiveness of the emulator. The emulator now uses GPU-side buffers (glBindBuffers / glBufferData) when the guest requests them, decreasing CPU overhead in some apps. Faster disk I/O: The emulator now uses separate threads to dispatch disk I/O, resulting in lower latency and better throughput (~1.5x sequential I/O speed, ~5x random access I/O speed). This also reduces the number of flushes to disk, resulting in much lower physical device load. The emulator now uses sparse files for disk boots on Windows machines, speeding up both first boot and "wipe-data" boots. When creating or resetting an AVD, the emulator now writes 100-200 MB of data to disk, instead of 2 GB or more. The emulator now uses Qt 5.7.0, which includes bug fixes and performance improvements. UI initialization no longer attempts to load all emulator executables as Qt plugins, so it's dramatically shorter, especially on HDDs. UI interactions are now faster and smoother, including rotation, window resizing, and extended controls window loading and closing.